A reminder for those who want to see something a little different – HARS will host a guest French Marine jet crew this Saturday as they fly into HARS Aviation Museum to pay respect to one of their former squadron aircraft. The Dassault Gardian maritime surveillance jet is due to land at Illawarra Regional Airport about 10.30 am. Subject to conditions on the day the crew will stay at the HARS Aviation Museum until about 3 pm. You can view a video of a Gardian takeoff here. The French crew from 25F Navy Squadron arranged the visit during one day of a Pacific training exercise from their home base in Tahiti. The former “French Marine” Lockheed Neptune 566 was built in 1959 and was recovered from Tahiti by volunteers from the Historical Aircraft Restoration Society (HARS). Although it hasn’t flown for some time, the HARS volunteers keep it in operational condition through regular engine runs. The President of HARS Aviation Museum, Bob De La Hunty, said Neptune 566 spent most of its life patrolling the Atlantic until it finished its career in Tahiti in 1984. After the French Government donated “566” to HARS in 1987 the museum’s volunteers spent almost two years making visits to Papeete Airport restoring the former long-range maritime patrol anti-submarine aircraft so they could fly it to Australia. “From our perspective, “566” is the finest example anywhere in the world of a Lockheed Neptune, since it is complete in its original condition inside,” Mr De La Hunty said. Squadron 25F now flies the Dassault Falcon 200 Gardian maritime surveillance aircraft, developed for the French Navy from the US Coast Guard Falcon 20 Guardian, a modified version of the Mystere/ Falcon 20 business jet (itself developed using the Mystere IV fighter as a starting point). HARS Aviation Museum also houses, and continues to fly, the only airworthy Lockheed Neptune aircraft formerly operated by the Royal Australian Air Force. 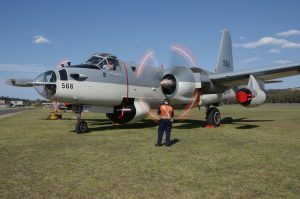 The P2V-7 was bought by the RAAF in 1962 and operated with 10 Squadron in Townsville until it was retired in 1977 then acquired by HARS in 1988. In the early ‘sixties, the US unified its aircraft nomenclature, so the P2V-7 became a P-2H and those fitted with sonobuoys became SP-2H. The Neptunes hunted submarines using sonobuoys, magnetic anomaly detection and submarine diesel engine fume detection systems plus a 70 million candlepower searchlight on the starboard wing tip. There are two types of sonobuoys the SP-2H can use – passive ones that simply listen (called “Jezebel” after a queen in the bible who listened at keyholes) and active “pinger” buoys (designated “Julie” and named after a stripper at a certain establishment next to the US naval research base that developed the buoy – “Julie” makes a passive buoy active). 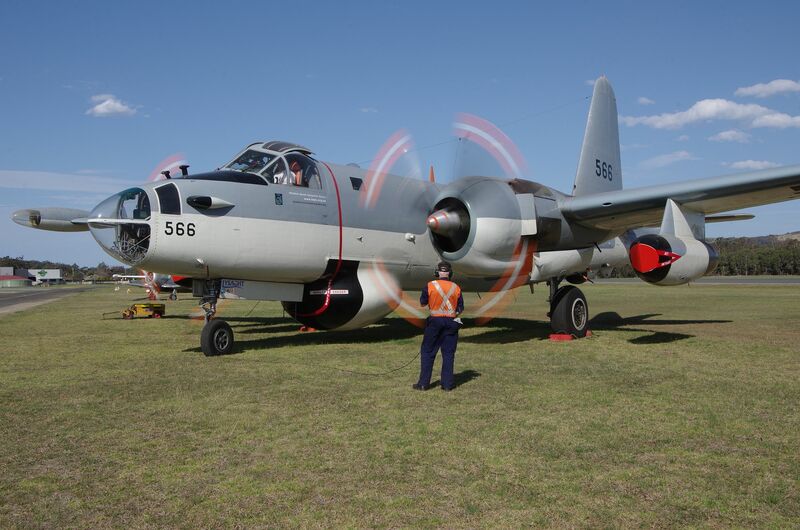 HARS Aviation Museum also is preparing to fly a former RAAF Lockheed Orion turbo-prop aircraft of the type currently being withdrawn from surveillance duty in Australia. Recently retired from RAAF duty, the museum’s AP-3C will be Australia’s only former defence Orion maintained to continue flying. HARS Aviation Museum, located at Illawarra Regional Airport, is open daily from 9.30 to 3.30. The museum’s acclaimed Café Connie is open for barista coffee plus a breakfast and lunch menu with a wide variety of hot and cold food at very reasonable prices … so when visiting HARS Aviation Museum you can make a meal of it.